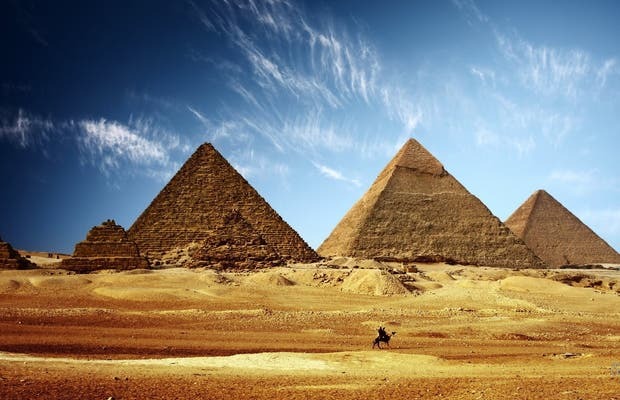 I've seen a lot of the great natural wonders, cathedrals, and ruins of the Western world, but none of them have been as impressive as the Pyramids of Giza. My advice is to get a ride out there (your hotel should be able to arrange something) as early as possible. The buses full of tourists and Egyptian schoolchildren (and the pushy peddlers) show up around 10am, so try and get there at 8:30 and you can at least have an hour to yourself. When I got there, there were maybe 20 other people at the most, which is a rare feat if you consider how famous the pyramids are. Alone, you can savor the sheer drama of the place: no sounds excepts for the wind, the sky so bleached with sand that it's practically white, and, of course, the three mysterious giants sticking up out of the sand.